You are here: Home / College / What Happens When You Don’t Get Enough Sleep? Over the past couple weeks, I’ve noticed that I’ve been feeling more sluggish and having less energy than normal. When I’m running, my legs have felt heavier and my natural feel-good pace has gotten slower. I was talking about this recent change with my running friends, and I realized that the only thing that’s changed is that I’ve been getting fewer hours of glorious Zzzzzzs than normal. I consistently get 6-7 hours of sleep per night but I’m coming to the realization that for me, it’s not enough. I don’t take naps and I typically don’t drink caffeine (unless coffee ice cream counts– I’m all over that), and I can usually power through the tiredness…but I think I need more sleep to be able to run and function the best. Obviously, we all know that sleep is important, but I was curious about what exactly happens when you don’t get enough sleep, because sometimes there are just too many fun things going on to sleep enough hours at night. So, I did a little “research” (okay, I read some articles from my favorite Runner’s World magazine). 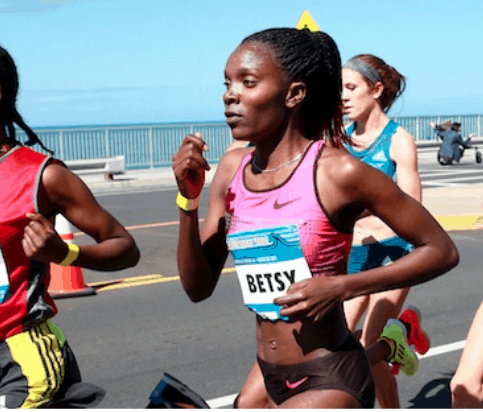 First, I read an article about Betsy Saina, an Olympic runner who runs a 14:39 5k. Girlfriend sleeps 9-10 hours per night, IN ADDITION to her 3 hours of daily naps to be fully rested for her workouts and races. Other elites, like Deena Kastor and Shalane Flanagan, say that they sleep 10 hours per night. Elite marathon runner Ryan Hall schedules daily naps into his calendar as “business meetings.” Obviously, most of us (all of us) don’t have that kind of time on our hands, but wow, sleep must be pretty important for athletic performance. Okay, so sleep’s really important for career runners. What about the rest of us? Most of us aren’t trying to go to the Olympics; we’re just running for fun and maybe hoping to improve our personal times. First of all, I found out that getting enough sleep is key for preventing workout injures. While we sleep, our bodies repair muscle, build bone, increase red blood cell production, and restock glycogen (our bodies’ fuel for running). Not sleeping enough also causes higher levels of the stress hormone, cortisol, keeping our heart rate higher and our nervous system on “constant alert.” Yikes, who needs higher levels of stress hormones?! 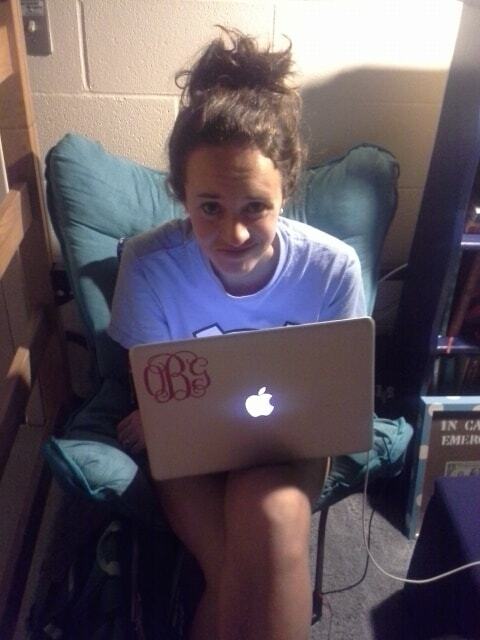 Exhibit A: my roommate snapped this picture while we were both working on papers at 1:30 a.m. a few weeks ago– lots of cortisol production (and roommate bonding!) going on here. Apparently, not getting enough sleep can also cause you to want to eat more. I read another Runner’s World article about a study where researchers measured appetite, levels of ghrelin (the hunger hormone), and ideal portion sizes in a test group of men. The men were first tested after sleeping for 8 hours during the night, and again tested after being sleep deprived. After a night of sleep deprivation, the men had increased appetite and levels of ghrelin. The men were shown pictures of 13 foods (7 meals and 6 snacks) and after the night of sleep deprivation, they also chose larger portion sizes to eat. I found this really interesting, and I could definitely see how it could be true. I know that when I’m low on energy, a lot of times it’s because I need food. So, when I’m tired, I often feel like I need to eat to regain energy– even when my tiredness is just from a lack of sleep, not from a lack of food. Lots of other things are going on when we don’t get enough sleep, too, but those are some of the interesting things I found that I’d share. I checked out several different articles and the consensus was that it depends on the person, their genetics, and how active they are. If you’re really active, you need more sleep! For me, that means that I can’t compare how much I sleep to people on my hall who don’t exercise much. A general rule of thumb seems to be 7-9 hours, but we each have to figure out what works for us. I’m not willing to skip out on fun times with friends to get more sleep, but I’m going to work on time management and planning ahead to try to get myself in bed earlier as much as possible. Questions for you: Do you have a goal for how many hours of sleep you want to get every night? My goal is 7-8 hours, but 8 rarely happens. Any tips or tricks for getting enough sleep? I would love to get 8 hours of sleep, but the only time I manage that is on the weekends (and usually only on the non-long run day). During the week I get between 6-7 hours. On the 6 hour days I definitely struggle through the afternoon! I think the afternoon slump is the hardest for me, too! I somehow get reenergized late at night a lot of times. This is one area of health I’ve always been really good at. I sleep at least 8 hours a night and take naps when needed. I used to feel guilty but they are sometimes a necessity! On very rare days when I don’t get enough sleep, nothing gets done well. I love sleep! During the week I get about 6 or 7 hours, maybe an extra hour on the weekends (if I’m lucky). Life is so busy, but I force myself to be in bed around 9:30 to get enough rest. I go through phases where I wake up a lot, on those nights I take melatonin before bed and it seems to help. You’re so right – sleep impacts all those things so much, and people overlook its importance. You go to bed at 9:30 and still only get 6-7 hours? Wow! That’s amazing that you can get yourself in bed early enough to make sure you can get enough rest. GREAT post!! a healthy amount of sleep is SO important! I def. feel my best when I get 8-9 hours! 🙂 When I’m lagging I often drink way too much coffee, which is often regrettable because then I can’t sleep that night either!! haha, I hear ya on the importance of sleep! I can completely relate to this post as a fellow college student who doesn’t sleep NEARLY enough. It’s just so hard when you have all these assignments/midterms/papers to balance out. Along with the fact that everything in college runs later. I 100% think that your running funk is due to not being well-rested enough! YES! I can’t go to sleep unless all of my assignments for the next morning are done and I’m ready for the next day’s midterm. I’m glad the lack of sleep/running funk thing makes sense to you, too. If nothing else, that should motivate me to start getting more sleep! We just learned about how important sleep is in my psychology class, and I was kind of shocked. I thought that my body had gotten used to my usual 5-7 hours per night and that I didn’t need more than that, but apparently almost all teenagers need closer to 9 to function at the highest level, and I know I definitely feel better that way! I’ve been trying to get to bed earlier, but I agree with you – it can be really hard! We actually just learned about sleep in my psychology class too haha! 9 sounds like an amazing dream but I’d be happy with 8 for now! I usually try for about 8 hours a night because if I don’t get enough sleep, it’s bad for me and everyone around me. Honestly, the reason I go to bed at a reasonable hour is because I live at home and my parents make me go to bed – I think in college I might have a hard time adjusting! You’re absolutely right – getting enough sleep is crucial for having enough energy, and it gets overlooked a lot as a component of a healthy lifestyle in favor of our diets and exercise. Good luck with your sleeping goals! I think everyone has a hard time adjusting to sleep in college haha! But some people more so than others. I definitely agree that sleep gets overlooked as part of living of a healthy lifestyle. I vary in the amount of sleep I get, but I aim for 8 hours. Sometimes I get more than that and feel sluggish all day and other times I get far less and am an energizer bunny. Our bodies are so weird! I’ve always been the first of all my friends/roommates to fall asleep, and now that I moved back home its even worse, I’m such a grandma haha. But whenever I have a problem falling asleep I usually make some herbal tea, read a book and I fall asleep real fast. If you’re staring at a computer/phone right before you go to bed the artifical light can actually trick your brain into thinking it’s day time, making it much harder to fall asleep! Ooh, those are great tips. I’m definitely guilty of staring at my computer right before I go to bed! Seven hours of sleep is my happy place right now, but eight hours would be ideal. It’s very rare that I can even sleep that long naturally! But I agree that my energy in everything decreases when I get less than 7 hours. That’s so wonderful that you can fall asleep so quickly!! Some nights I can fall asleep in a minute, but other nights it can take an hour or so. It’s crazy to me that just an hour more or less of sleep can make SUCH a big difference in how we feel! It doesn’t seem like it should affect us that much, but I guess it really does. Ugh I’ve found all these things to be true! I usually get 6 hours of sleep, sometimes 7. I know it’s not perfect but it’s progress! And those nights that I stay up extra late to watch Netflix, oh HECK YES I notice a change in my eating the next day! I turn into a crazy person when I don’t get enough sleep haha! These days I can barely stay awake past 10. I try to get at least 8 hours of sleep a night. You and me both! I’m definitely not fun to be around when I’m running on just a few hours of sleep. 8 hours is an awesome goal! Wow, those elite runners get a lot of sleep! I wish I could get that much every day. I have early classes plus I work late some nights (+ the assignments I have to complete when I get back to my apartment), so I definitely do not get as much sleep as I should. I am looking forward to getting some sleep over Spring Break though! You and me both! I’ll definitely be using my spring break to get some extra sleep 🙂 And wouldn’t it be awesome if our jobs consisted of basically unlimited running + sleeping? Thank you for the reminder to get more sleep! I generally get between 5 and 6 per night, but that’s really not enough. My goal is definitely 8 hours, but I would have to be in bed by 8 to do that! Yikes, 8 pm would be a nearly impossible bedtime! I hope you get a break to catch up on some sleep soon 🙂 Maybe over spring break? Haha! Too funny that you fall asleep watching TV after dinner but definitely understandable since you have to get up so early. Sacrificing some sleep is definitely worth it to be able to fit a workout in 🙂 Oh, the things we do for our running! As hard as it is (and I don’t follow this enough myself) but getting away from electronics and letting your body slowly shut down helps a lot for getting a more restful sleep. I definitely needed this reminder! Also sleeping is the best way to stay healthy and blooming all day long. It keeps your mind active for daily activities, but lacking of sleep can hinder everything. I also get easily disturb with any noise I hear in my deep sleep that turns out that I can’t go back to sleep. That is why I have decided to install a noise machine to my room that minimize any noise. I have my enough sleep now for 1 month. There are many articles all over the internet about tips on how to have a better sleep, but there are only few which tells you what happens when you do not get enough sleep. I believe that in order to really see the importance of sleep for us, we should know the toll on our bodies when we lack sleep. Thank you for this informative article! I’ve found that lack of sleep usually causes me to eat like a real a-hole… All the nutritional planning gets swept aside after a bad night of sleep. – a gratitude list at night to calm a racing mind. – leaving the cell phone in the other room. – kicking the TV out of the bedroom. Getting a great night of sleep is super important. I am so guilty of looking at my phone and laptop before I go to bed! I’m trying to reduce my times on my electronics before bed, since I know it can reduce the effectiveness of sleep. You have pointed out good points. Thanks for sharing great things. If you need good sleep don’t stare at smartphones before getting to bed…instead read a book and have a cup of chamomile tea or maybe hit a melatonin tabs. What bothers me is upper back pain which comes and goes..I tried PT and posture braces but these seem to have temporary effect…any long term back pain solutions for a good night sleep? Great tips here!!! It is actually very important to get a healthy amount of sleep daily. Thanks a lot for sharing. I personally don’t eat more when I can’t get enough sleep but I almost go crazy. Thanks for sharing your idea, Liv. As a pre-med student, I’m in the minority that suffer from lack of sleep. Anything you can say advice wise for those of us who have a hectic and busy schedule?